Last week I looked at the three “P’s” of human color perception– physical, physiological and psychological– as a way to help define a color gamut for the ideal display. Based on real world examples from art and commerce, I concluded that the range of colors found in nature, as measured by Pointer, provided the best fit with our two design goals which were an accurate and exciting, immersive experience. This week, I’d like to get a little more practical and take a look at existing color gamut standards to see what we might realistically be able to achieve today. 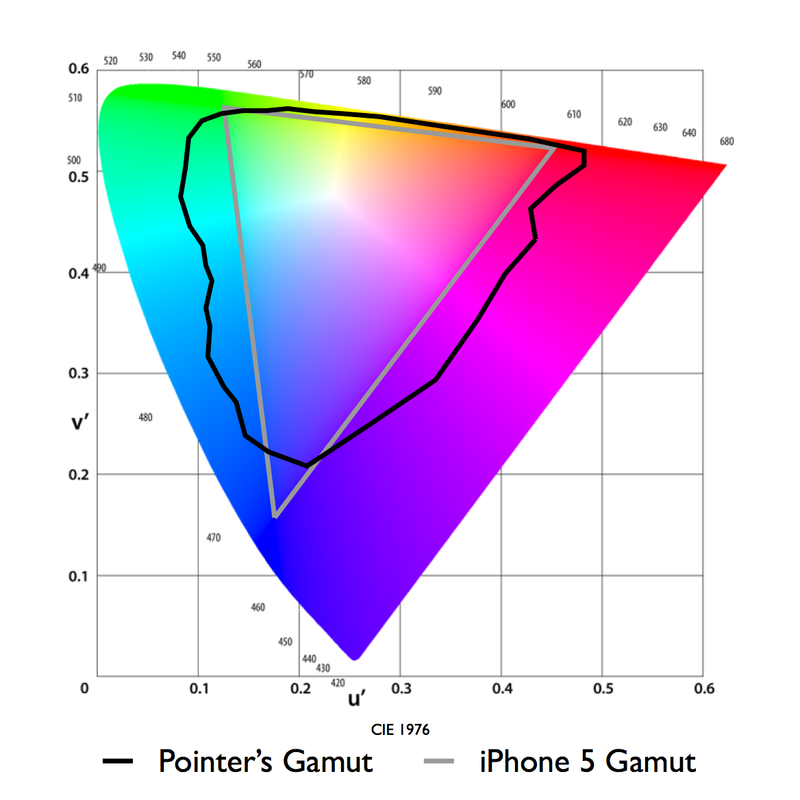 Color gamut of 4,000 surface colors found in nature as measured by Pointer in 1980 against the color gamut of the iPhone 5. The first thing you’ll notice about Pointer’s gamut (pictured above again) is that it’s a pretty odd, squiggly shape. This means it is going to be difficult to cover efficiently with a three primary system that mixes just red, green and blue to create all the colors we see, like the LCD found in the iPhone. In order to cover Pointer’s with just those three colors, we’d need to make them extremely saturated. There are proposed standards that take this approach, such as rec.2020, but since they are not practical to implement today from a technology standpoint I’ve decided to ignore them for this discussion. Let’s start with Adobe 1998. Many people are familiar with this color gamut since it is found as an option on many consumer cameras and it is popular among creative professionals. It certainly covers a significantly wider range of colors than the HDTV broadcast standard with a very deep green point. The rich cyans that we talked about in the movie “The Ring” would look great in Adobe 1998. But, we’re not getting any more of those exciting reds and oranges. 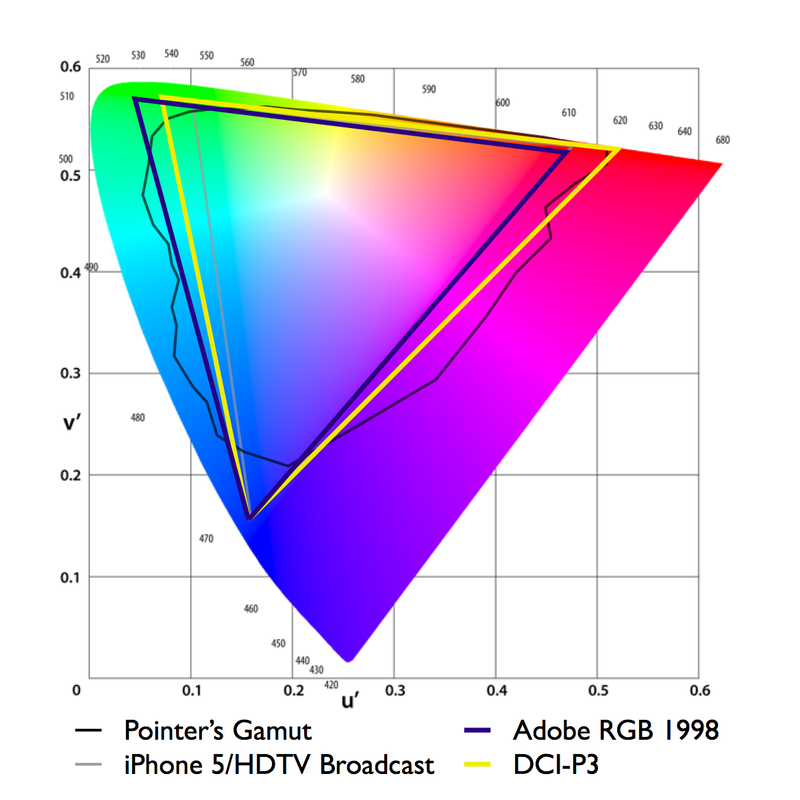 In fact, Adobe’s red point is identical to the HDTV broadcast standard. What about DCI-P3 then? Designed to match the color gamut of color film and used in cinemas all over the world, DCI-P3 has a very wide gamut. The reds are particularly deep and, of course, all of the colors from the movies we looked at are covered. Still, it’s missing a lot of the deep greens found in Adobe 1998 and only just fits the green Pantone color of the year. So DCI-P3 is not quite perfect either. What about a hybrid, custom gamut? What if we combined the green from Adobe with the red from DCI-P3 and their shared blue point? We’d end up with pretty good, high 90’s percentage coverage of Pointer’s gamut, coverage of all of the existing HDTV broadcast content, full coverage of cinema content from Hollywood and a superior ecommerce experience with most of the colors from the natural world covered. Looks pretty great and we can make displays now that cover this color gamut with today’s technology. But how would it work on the content side? Would we need to get together and agree on this new standard and then wait for years while it is slowly adopted by content creators and display makers? Next week we’ll look at how content delivery might evolve to support gamuts like this without the need for major changes to broadcast standards. Sony’s 4K content delivery plans have been one of the most talked about topics here at CES. Less mentioned was Sony’s inclusion of wider color gamut in their standard. Sony reps that I talked to said that both the 1080P Blu-ray disc-based “mastered in 4K” and pure 4K delivery methods would include a wider color gamut. They were not ready to release specifics on gamut size or whether it would meet existing standards like DCI-P3. Still, bringing “expanded color showcasing more of the wide range of rich color contained in the original source” is a move in the right direction for wide gamut. 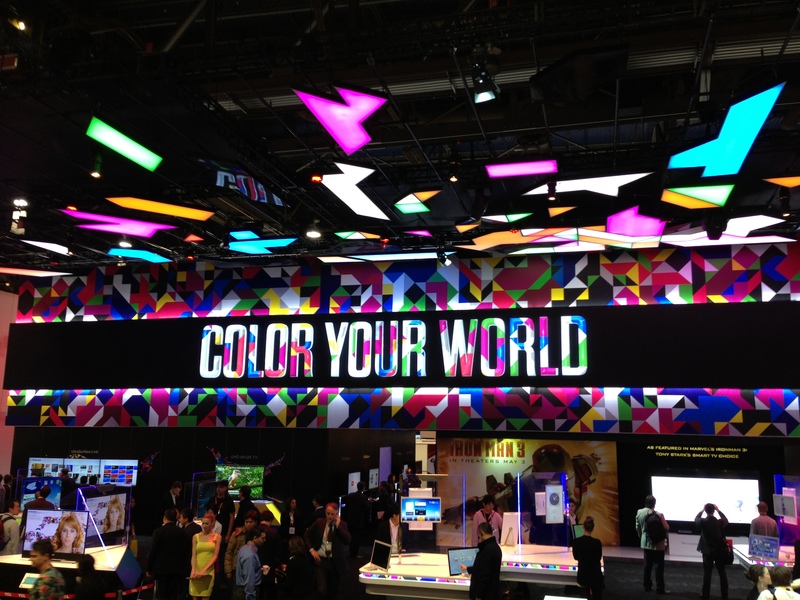 Technicolor’s ecommerce Color Certification demo at CES 2013. 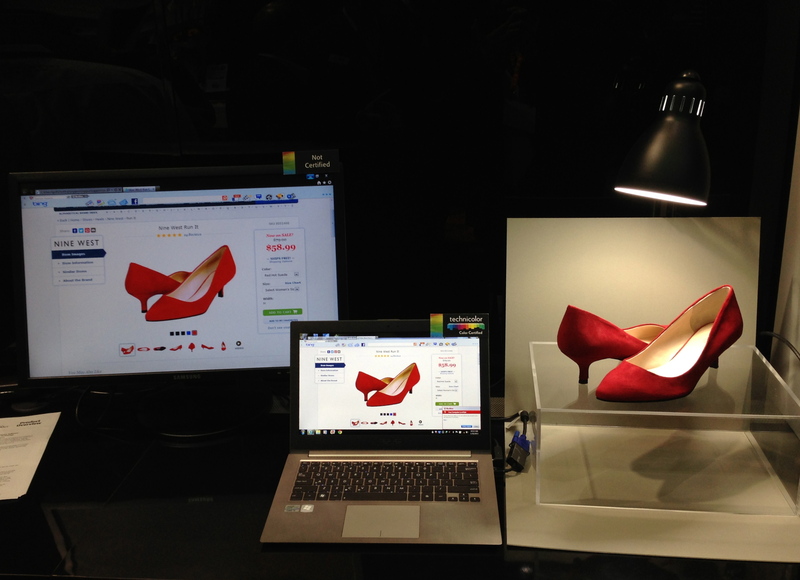 The color certified laptop in the middle of the frame more accurately shows the color of the shoes. Like Sony’s upscaling effort, this kind of technology could help drive wide color gamut adoption by making today’s content compatible with newer displays. 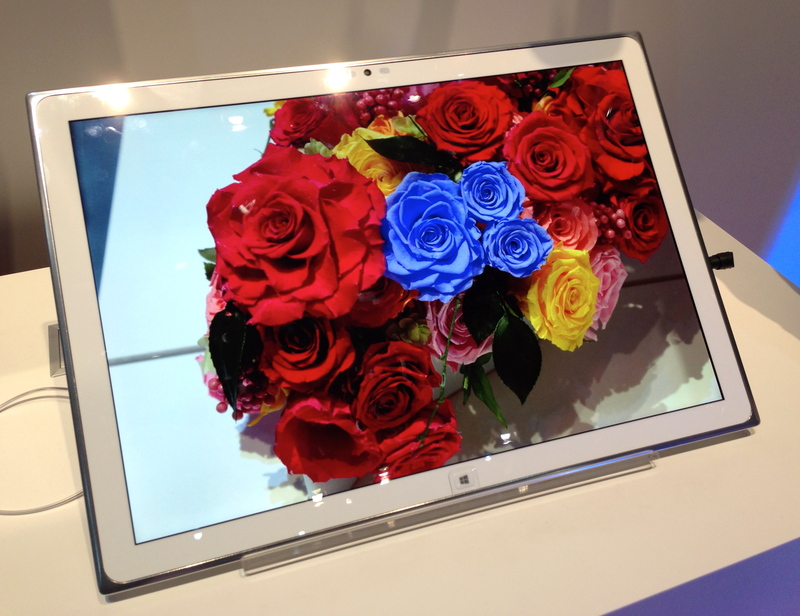 Several companies at the show introduced devices in a new class- the 20-plus inch tablet. While there were a lot of hokey multi touch gaming demos (are you really going to play poker with 4 smartphones and a 27″ screen instead of a deck of cards? ), the content creation stuff Panasonic showed actually made me think the new form factor shows real promise as a professional tool. Their tablet, which measures 20 inches on the diagonal, features a 4K IPS panel that covers 100% of the sRGB color gamut standard. Having such a a large canvas with high resolution, accurate color and multi-touch could be great for creative pros like photographers and architects. Seeing red: can color change your spending habits? 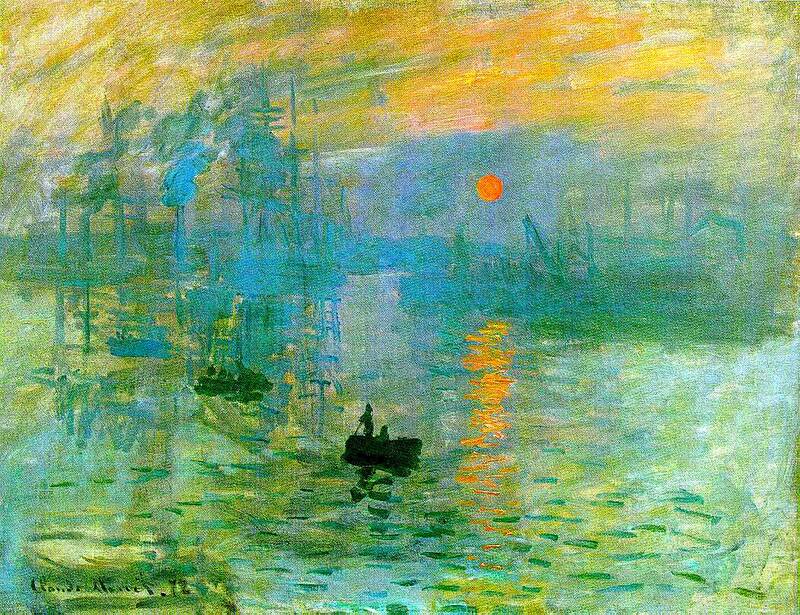 Color can have a powerful physiological effect on us. 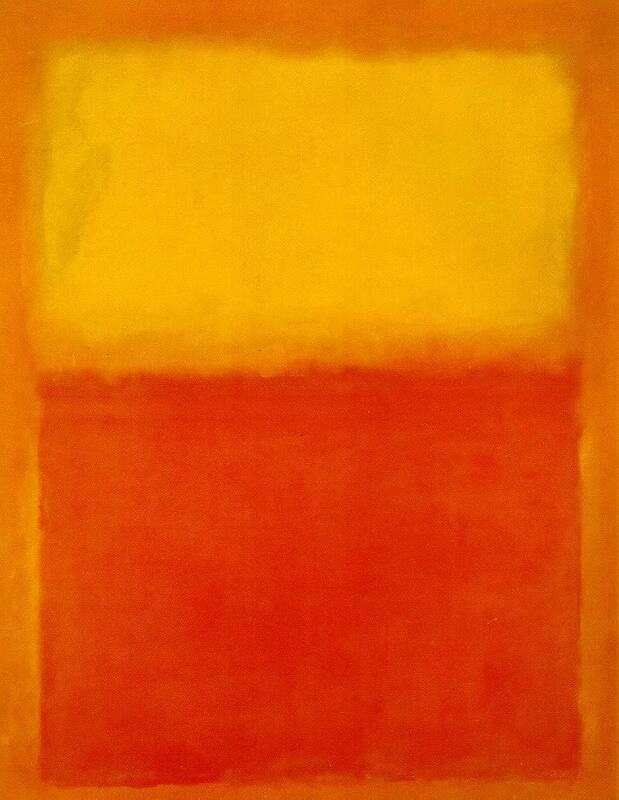 This should come as no surprise to anyone who’s ever been wowed by a Monet or a Rothko. But color can affect us in ways you never imagined. Recent studies suggest that that the color of a uniform can affect the outcome of an Olympic wrestling match and onscreen colors can influence how much you pay for something on eBay. In one study, researchers found that Olympic wrestlers wearing red won as much as 60% of the time, even against evenly matched opponents (who wore a different color). Why? The exact mechanism remains a mystery but researchers see some evidence that aggressive colors like red may actually cause a spike in testosterone levels. I find it particularly fascinating that color choice did not specifically correlate to the price someone paid for an item. Instead, the colors drove more or less aggressive behavior, which lead participants to either seek the best deal possible against a salesperson or to beat out competing bids in an auction. It got me wondering how retailers might be using color to influence purchasing. A quick survey of some popular online shopping destinations yielded potentially interesting results. 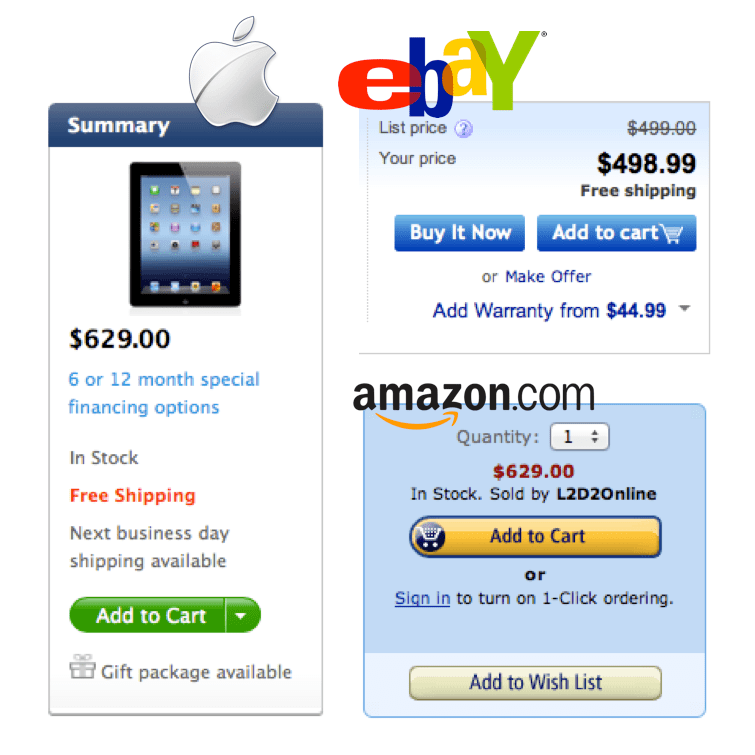 Since product background is not always in the control of the retailer, I looked at the “add to cart” areas of three popular online retailers: Apple, Amazon and eBay. All three employ a lot of blue, a calming color, in their ‘add to cart’ areas. Apple uses a shade of green, another calming color, for the “add to cart” button. Amazon lists the price in a dark red, while Apple uses a lighter shade to accentuate free shipping. Next time you find yourself shopping either online or brick and mortar, take note of the colors around you – you may be surprised by how far your environment is being manipulated to get you to pay more.